What fun crafts or activities have you enjoyed making with kids? Please share them with me in the linky and/or comment below. some of the other links & our Pinterest board! My girls are really intrigued by pinwheels and kites lately. We'll have to make some of your DIY pinwheels! Thanks for including our water balloon compilation today! 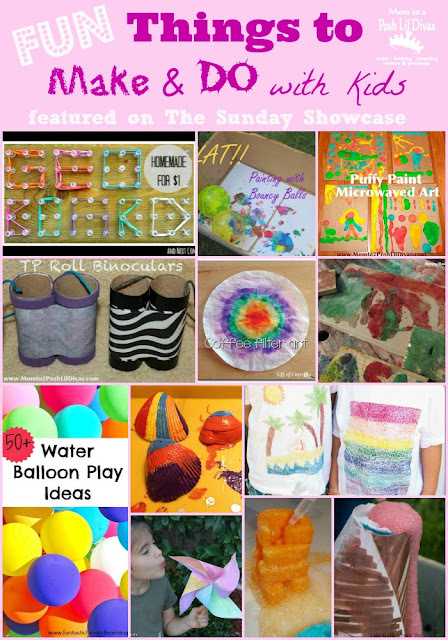 Thanks for sharing our sand art in your feature this week! And a big thanks for hosting, looking forward to visiting the other featured activities! Thanks for hosting and for featuring our Erupting oobleck! Thank you for sharing our Splat!! Painting Activity!! Have a wonderful weekend! thank you for sharing our sandpaper art t shirts! have a great weekend! Thanks for sharing our icy, fizzy letters! 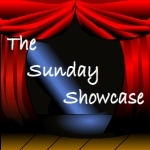 Always fun to check out the Sunday Showcase. :) Hope your weekend is going well. Love those sandpaper t-shirts - we're trying those this summer! Another great round-up! Thanks for hosting! Love the summer learning fun ideas! Pinning this, because I can see a lot of ideas I can try with my son :) Thank you!